The Suffolk County Parks Dept. has opened its first off-leash beach–where dogs can run, swim and play off-leash–at the end of Roe Avenue in East Patchogue. 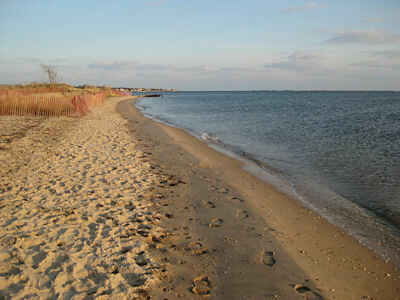 The sandy beach is approximately 300 feet long and 300 feet deep and opens onto the Great South Bay. Currently, the beach is open daily from dawn until dusk. Called Mud Creek County Park, for the creek that runs along the eastern border of the site, the off-leash area is the first new dog park created under the Five New Dog Parks initiative, which LI-DOG championed and was signed into law in May 2007. The beach is also the first new Natural Borders Dog Park created in Suffolk County. The designation allows for the creation of dog parks that are not surrounded by chain link fence, but rather defined by natural boundaries such as water or large expanses of land. The new off-leash beach has no amenities—no trash receptacles, no poop bag stations, and no dog water fountains. The beach is considered “carry-in, carry-out” where people will have to pick up after their dogs and take away the waste themselves. LI-DOG has expressed concerns about the lack of waste receptacles at the beach. However, according to the Parks Commissioner, “in more remote locations,” trash cans have attracted waste people can’t discard in their regular pickups such as motor oil and waste gasoline. He also said the site is too far away from other Parks Dept. facilities for regular servicing. Given that the Parks Dept. is operating the off-leash beach as a pilot program, it is critical that dog owners do a good job picking up after their dogs and disposing of the waste properly –in a way that will not raise opposition to this new program in surrounding communities. The pilot program will run from now until March 1, 2010, so keeping the beach clean and free of any problems this fall and winter will be critical. Please let all your fellow dog owners know the situation! The off-leash beach will operate from at least Sept. 1st through March 1st every year. From March 1st until the end of June, the beach will be closed to off-leash dogs and be monitored for endangered nesting birds. If no nests are established by the end of June, the off-leash beach will reopen in July or August—as is the case this year. Along with this article, we also are posting the additional rules for the off-leash area and the Suffolk County Parks Dept.’s detailed description of the pilot program and the conditions under which it will operate. Make sure to read item seven of the description as it makes it very clear that the park can be closed if it’s not taken care of. Please note: Roe Avenue is a town road and cars are allowed to park on the road during daylight hours. That means, people can park on the road from dawn until dusk when the off-leash beach is open. Warning: Please note that pieces of glass have been found throughout the sandy part of the dog park. Keep dogs on the beach and exercise caution when visiting this site. As always, let us know what you think by emailing us at lidog_news@yahoo.com.